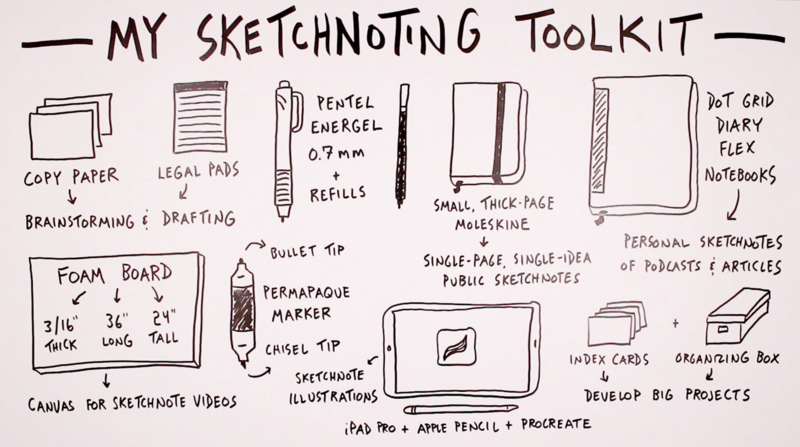 There is no shortage of note-taking tools for you to choose from, so to help you explore the options I’d like to share with you my own sketchnoting toolkit – the materials that I use on a daily basis. First I’ll share quick links to all of them, and then I’ll dig a bit into how I use each and why I like them. 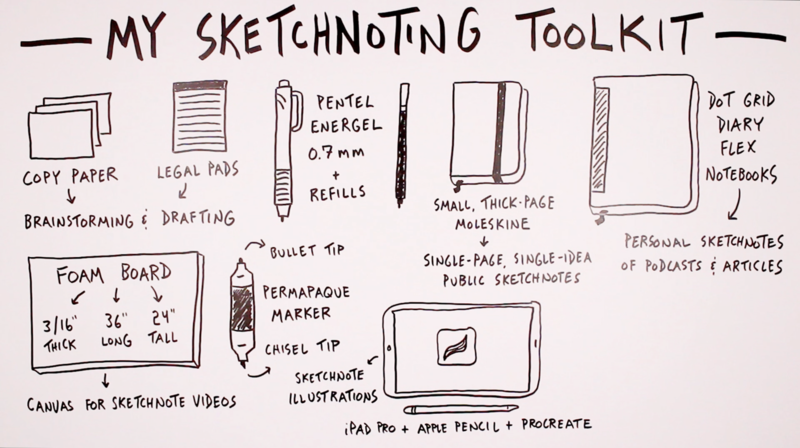 The sketchnoting tools that I use on a daily basis. Now let’s take a look at each of those materials and why I enjoy using them. Let’s start with the most inexpensive and easiest to find of the materials that I use: copy paper and legal pads. For brainstorming and drafting I go with affordable and accessible paper products: copy paper and legal pads. I enjoy using those at the early stages of anything that I’m working on for the initial brainstorming and drafting of ideas that I might later polish up in some way. Whether I use blank copy paper or lined legal pads just depends on the mood I’m in. For whatever reason, sometimes one is more appealing than the other. 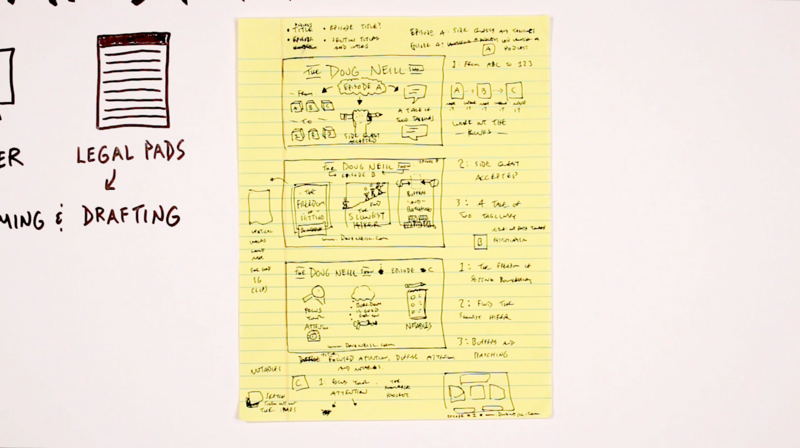 Getting a feel for the layout of ideas for a video. Fine-tuning the sketches I’ll included in a video. Next let’s take a look at some legal pad drafting. 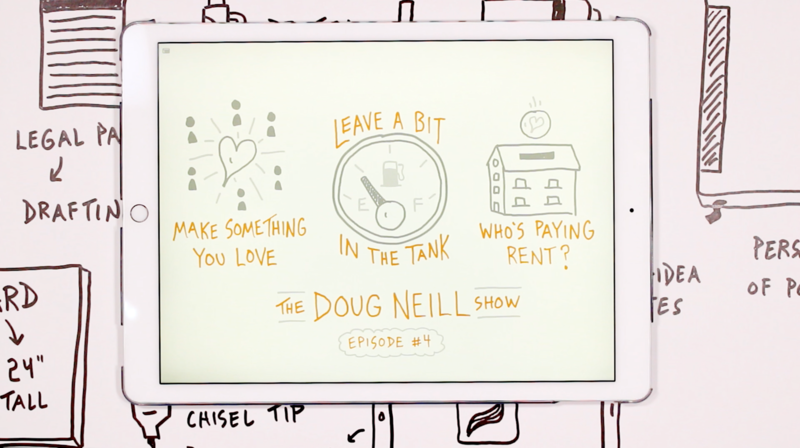 Drafting featured images for my new podcast, The Doug Neill Show. 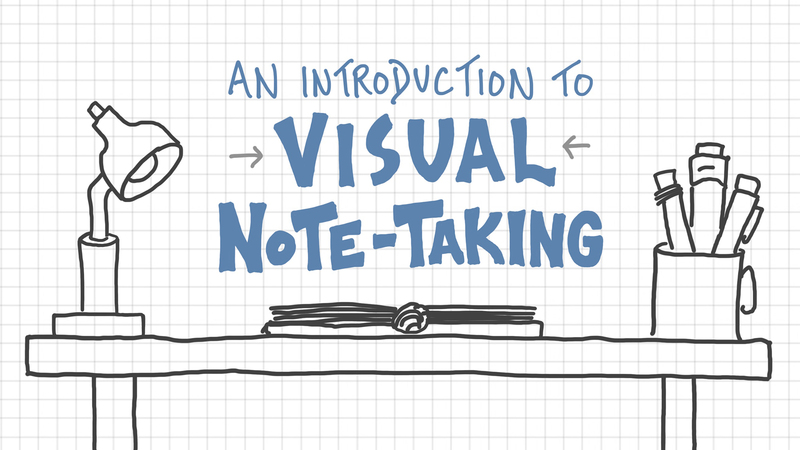 Each podcast episode has three segments to it, and I decided to include a mini sketchnote for each. In the image above I’m working out what those mini sketchnotes might look like, and how to also fit in the title of the podcast and the episode number, working out those details in a low-pressure way. That’s what I like about using copy paper and legal pads. I don’t feel any pressure when I’m making marks on the page. I’m not distracted by fancy or expensive materials. My go-to pen for all of my small-scale sketchnoting is the Pentel Energel 0.7mm tip, along with ink refills that I can buy in bulk so that I don’t have to keep picking up that plastic casing. 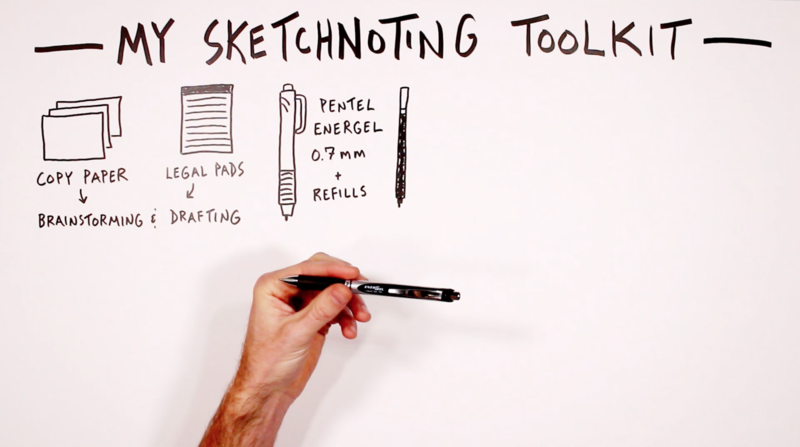 My go-to pen for small-scale sketchnoting: the Pentel Energel 0.7mm. I keep a stash of those refills in a drawer in my office and also another stash in my backpack so that I never have to worry about running out of ink. One of my favorite notebooks to sketchnote in are the small thick-page Moleskines. For the sketchnotes that I share on Instagram, I use a small Moleskine sketchbook with thick pages. That’s the notebook that I use specifically for single-page, single-idea public sketchnotes – the sketchnotes that I share on Instagram. I love the quality of those thick pages. 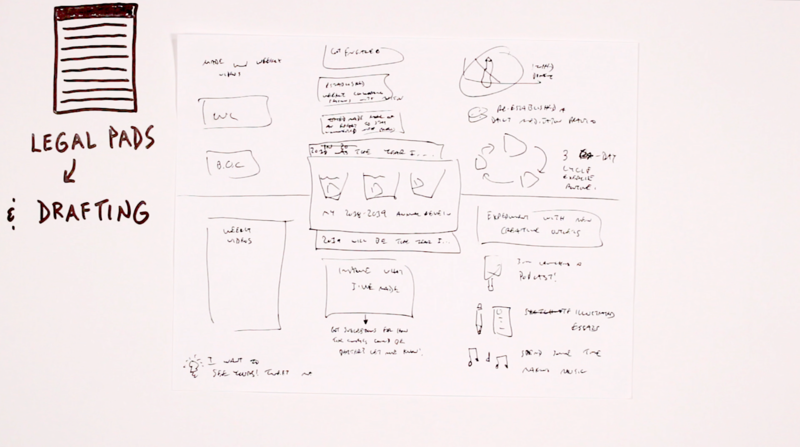 I also like the small size – I find that to be a helpful constraint when sharing any individual idea. 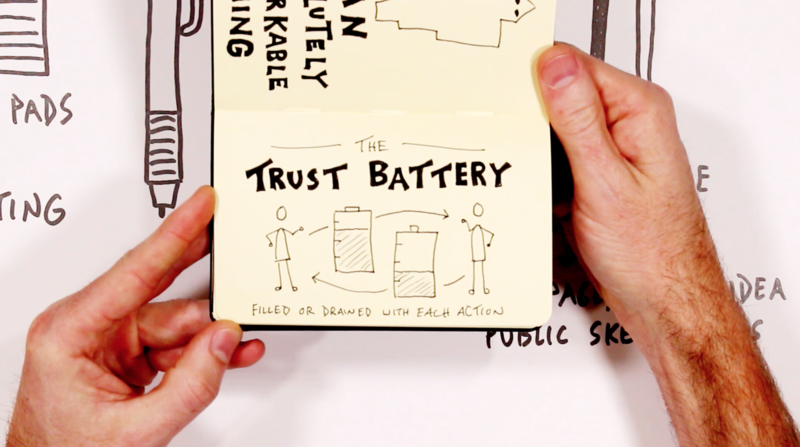 The small size is a helpful constraint when sketching out and sharing ideas. It’s great to have a go-to place to share something small publicly – maybe a visual journal entry from my day, a book that I recently finished reading, or a single idea that I came across that felt impactful. 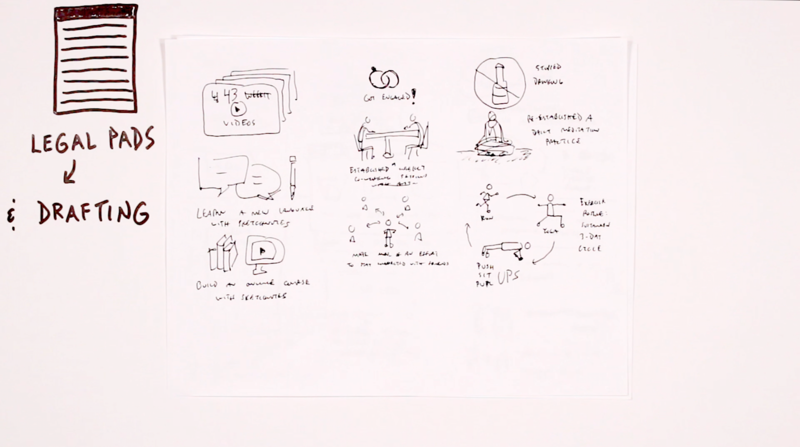 While I enjoy sharing some of my sketchnotes with others, I do think it’s important to have a space where you’re taking sketchnotes only for yourself. That’s what this next notebook is for – a dotted DiaryFlex notebook that I use for my personal sketchnotes of podcasts that I’m listening to or articles that I’m reading. 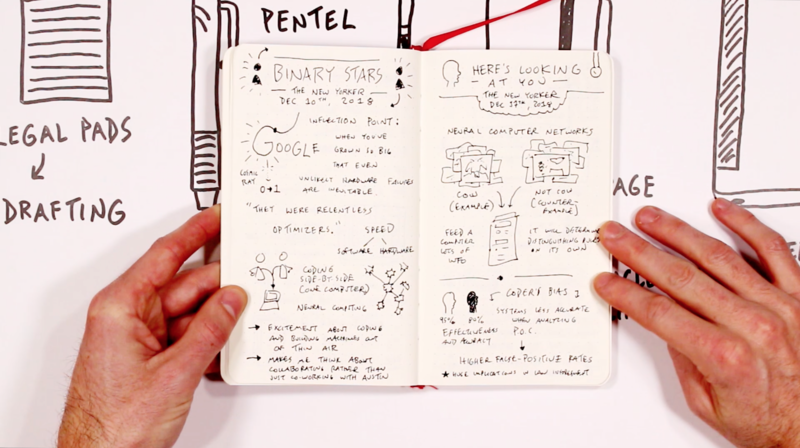 I enjoy the dotted DiaryFlex notebook for my personal sketchnotes. What I like about these notebooks is that they’re essentially just the inserts without the cover, which keeps the cost pretty low. So you can pick up just one cover and keep reusing that even as you fill notebook after notebook. Shoutout to my friend Raven Henderson who sent me my first DiaryFlex notebook! I got hooked pretty quickly and I’ve picked up many since then. I use this notebook to take notes on articles I read and podcasts I listen to. I’ve enjoyed the lightly printed dot grid on these pages because it provides structure when you want it, but you can ignore those marks when you want to go with a more freeform approach. That notebook has been a nice place to capture ideas that don’t necessarily fit into any current project but that interest me for one reason or another, and that I might want to revisit in the future. My next go-to materials are foam boards: large rigid surfaces that are 3/16 of an inch thick, 36 inches long, and 24 inches tall. 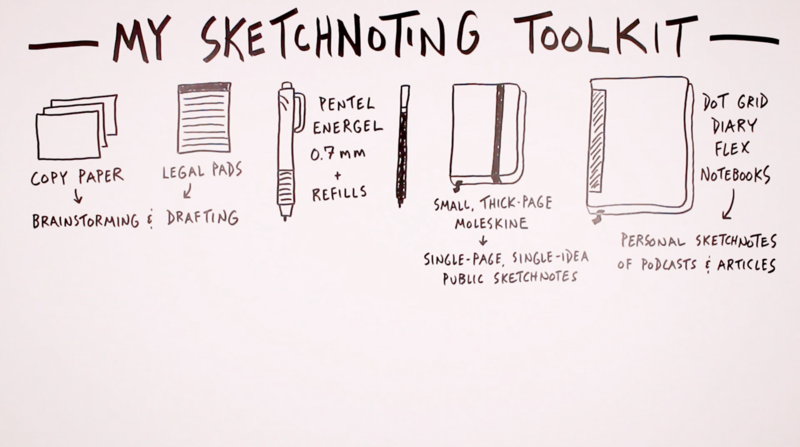 I use rigid foam boards to create sketchnote videos like what you see at the top of this post. I’ve been enjoying using those foam boards over paper because they feel a little bit more permanent. It feels like this sweet spot in between paper that you could crumple up and throw in the recycling bin and a fancy art canvas meant to be hung from the wall. I think that helps me bring a little bit more care and attention to the marks that I make when creating videos, but not so much that it adds unnecessary pressure and anxiety. To make the marks on those boards within my videos I’ve been using the double-sided Permapaque marker that has a bullet tip on one end and a chisel tip on the other. 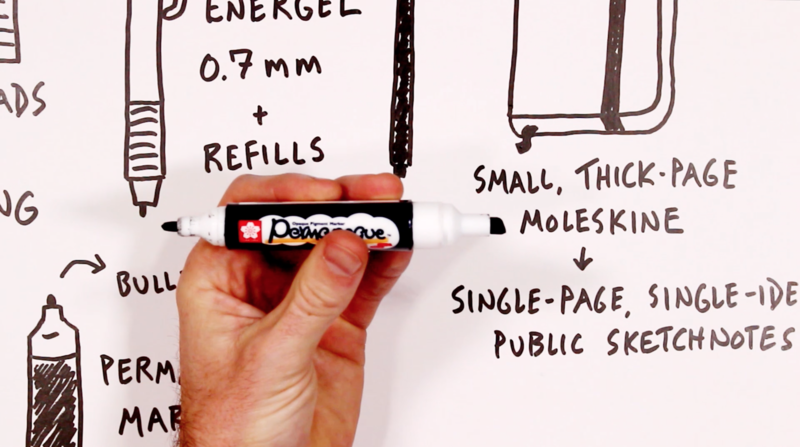 These dual-tip Permapaque markers are great for large scale sketchnoting. I’ve been enjoying the simplicity of just those two options to add a bit of a variety, a bit of hierarchy to these videos, while also just sticking to a single black color. Though I most enjoy using pen and paper tools when doing my sketchnoting, I do have one digital go-to, and that’s the iPad Pro along with the Apple Pencil and the app Procreate. The only digital sketchnoting tool I use: the iPad Pro with Apple Pencil and the app Procreate. 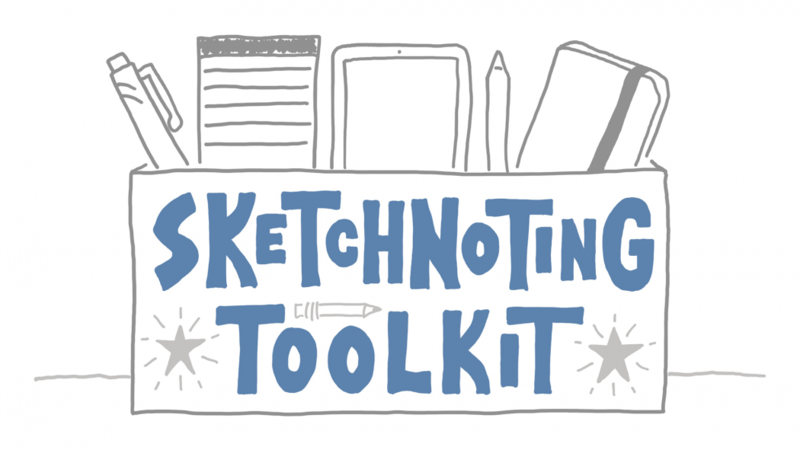 I use that combo of tools for what I consider to be sketchnote illustrations – not rough first-time sketchnotes but slightly more polished, presentable ideas. That’s what I’ve been using for the thumbnail images for recent videos here as well as for the featured images for my new podcast that I mentioned drafting earlier on those legal pads. Here’s an example of the featured images that I’m creating for my new podcast. I’ve been enjoying the use of a few colors, the use of layers, and the flexibility of a digital sketching tool to move things around a bit and do the type of editing that you can’t do with pen and paper. 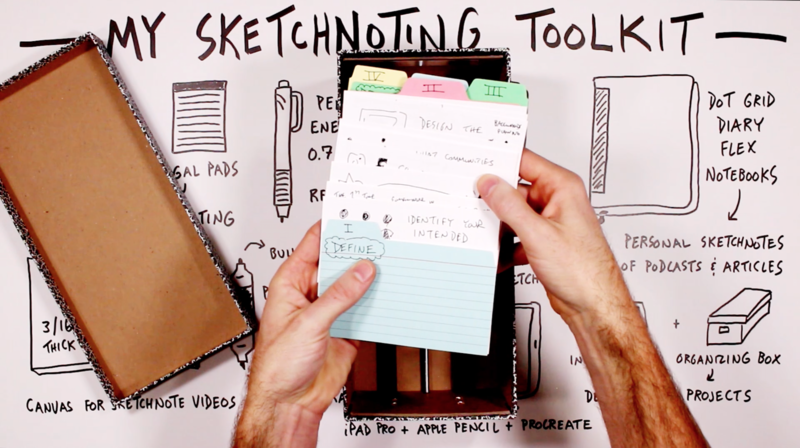 There is one final tool combination that I wanted to share, moving back in the analog direction: index cards and a shoebox-sized organizer. I’ve been enjoying the combo of white index cards for project details and color cards with tabs for the overall organization, all within a single box that I can put a lid on and store on the shelf. I have been using that combo to help me develop big projects. 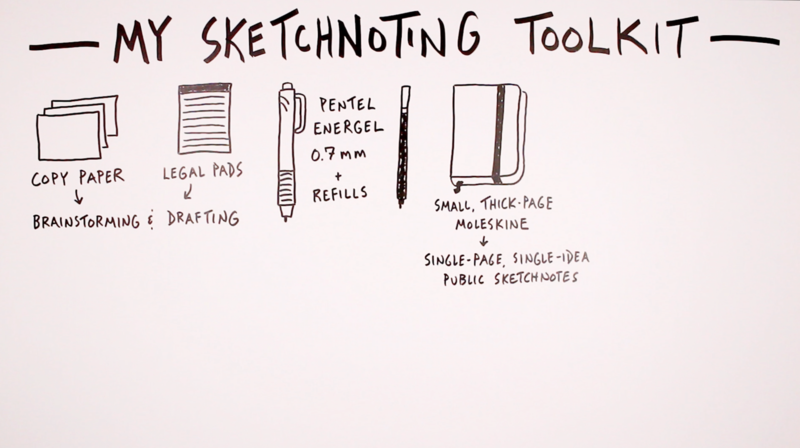 Specifically, I’ve been using it in the development of the resource Build an Online Course with Sketchnotes. I’ve been enjoying the ability to capture individual ideas on those white index cards and then use the tabbed color cards as I experiment with the overall structure of the ideas that I’m sharing. So when it comes to something like developing a new course or even writing a book, I think a tool combination like this has a lot of potential and I’m excited to continue experimenting with it. 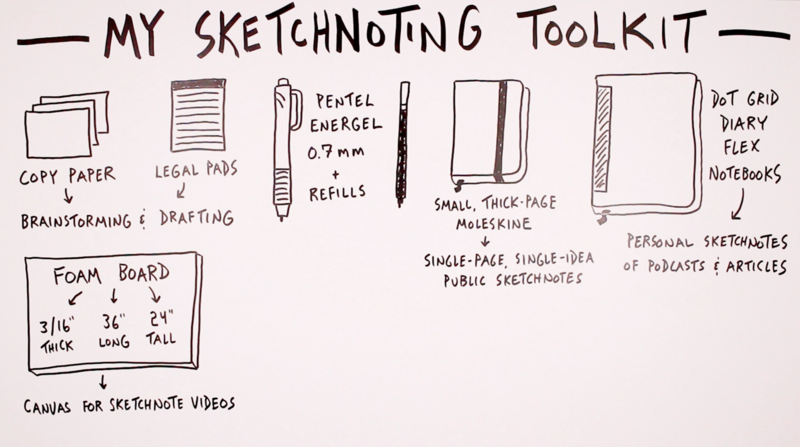 So that covers all of my favorite sketchnoting tools and how I’m using each of them! If any of them sound appealing to you, do feel free to pick them up and do some experimenting yourself, with the goal of finding the materials that are best suited to their purpose. Remember that it’s not about buying fancy materials for the sake of having something that looks cool. Instead it’s about gathering the resources that help you to do the work that’s important to you. 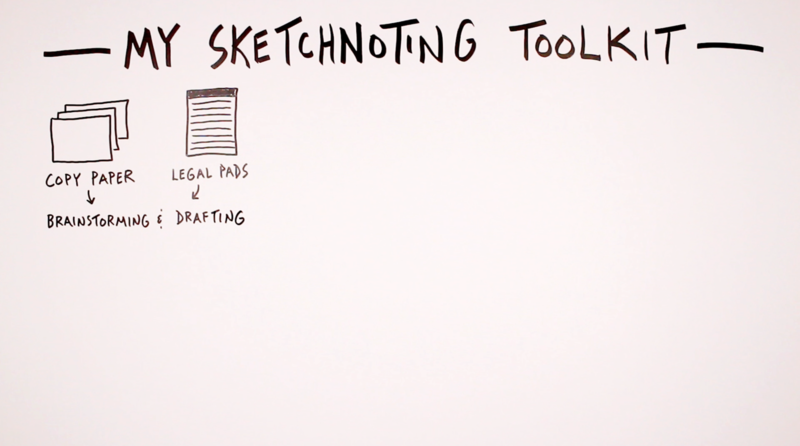 So be sure to keep that in mind as you do your own experimenting and as you build up to your own sketchnoting toolkit. I hope you enjoyed seeing the tools that I use on a daily basis. Good luck as you seek out those that will work well for you.